Brewing is a way to make potions using the brewing stand. 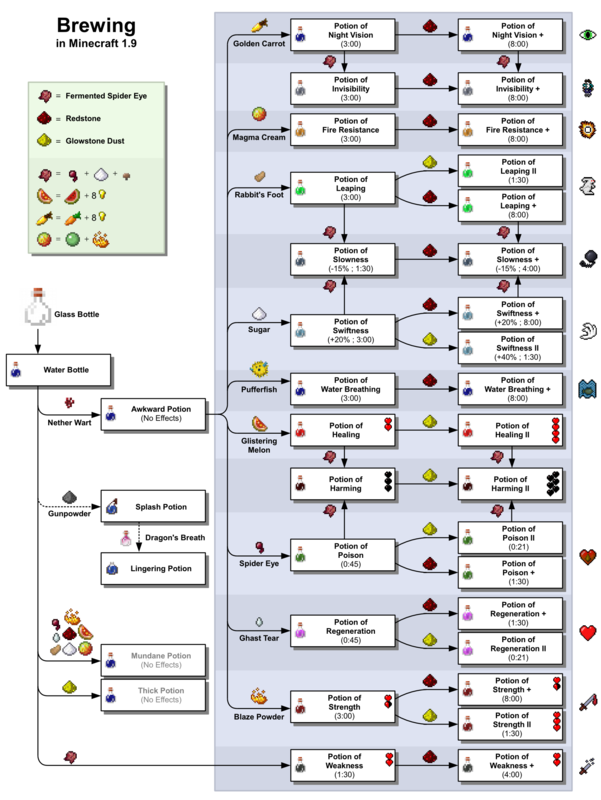 Potions in Mine Blocks are based on this chart. Brewing stand - To brew the potions. Blaze powder - Powers the brewing stand. Empty bottle - Essentially an empty potion; can be filled with water to create the bottle of water, which is the starting point for every potion. Water - Can be in a cauldron, or just a regular water source. For the more about individual potions and their effects, please see: Potions. These recipes only require a bottle of water as a base. These require a primary potion as a base. The fermented spider eye can be added to potions, usually to create potions with reversed effects, however sometimes to make potions different in some other way. These can be added to any potion with effects to extend its length or increase its potency. 44 Brew a potion Brew a potion by adding an ingredient to a bottle of water. 1.28 (to be fixed in 1.29[Source]): If the player adds redstone dust to a weakness or regeneration potion, the potion will have the empty bottle texture and be renamed to potion. The redstone dust will not have been used, still being in the brewing slot and not having affected the potion. The potion does not give the player any effects if drunk. This page was last edited on 4 April 2019, at 21:29.